Eating alone doesn’t have to mean eating badly. Some people think cooking for only themselves isn’t worth the effort. I think single people deserve food love, too, and should expend the effort. One of the best ways a person can show herself some love is to cook for herself the same way she would cook as if other people were going to eat the meal with her–to expend the same amount of time and deliberation on herself as she would on family or friends. I learned this when I moved out of a communal house to live by myself. Eating a bowl of cereal for dinner is fun once in a while. Eaten every night, it becomes a soggy symbol of loneliness, which catches in the throat like a withheld sob. Eating alone doesn’t have to mean eating sadness. I celebrate my freedom to cook and eat whatever I want. I don’t have to cater to anyone else’s tastes, the way so many married couples and mothers feel they have to do. Sometimes, I cook an elaborate meal that produces a week’s worth of lunches: creamy lima beans and brown rice, New Orleans-style, spicy with sausage and chopped seasoning; vegetarian lasagna thick with eggplant and mushrooms, or Thai coconut shrimp curry spiked with red bell peppers and slivers of onion. Sometimes, I cook something small every day, choosing from the fruits, vegetables, and whole grains I keep stocked in the refrigerator. I want the experience of having a variety of home-cooked meals, just like I had when I lived at home with my parents. Eating alone doesn’t have to mean eating mindlessly. I set the scene for my dinners. I drink water or iced tea in a real glass, which is placed to the right of my small plate. To please the eye, the food is arranged carefully, a rainbow of colors and textures. I use a real fork, which is placed on a cloth napkin next to my plate. I sit at the dinner table with a hardback book to keep me company. I would light a candle to add a little extra atmosphere, but I’m afraid I’d set myself on fire, and there would be no one there to call 911 while my hair was aflame. These are the kinds of things I think of when I eat alone. Eating alone means eating whatever the hell I want. One of my favorite single-serving meals is sautéed spinach topped with a fried egg and roasted sweet potato fries. I mash the egg into the spinach, allowing the warm yolk to run through the leaves, coating them in a rich golden sauce that melds with the salt, pepper, and olive oil. The sweet potatoes are seasoned with Shichimi Togarashi (a Japanese seasoning containing ginger, orange peel, sesame seed, red pepper, seaweed, and ginger) or with sea salt and black pepper. For dessert, I might have apple slices or a clementine and a cup of Earl Grey with a splash of soymilk. The dinner is balanced: charred, salty, creamy, sweet. Most people would find this meal unusual. It does not center on meat. Spinach and sweet potatoes generally don’t go together. Many people think of eggs as only breakfast food, or as an essential component to baked goods. Few people in the United States eat fruit with dinner. I don’t care. It’s my dinner and I eat it by myself, away from the judgment of others. Eating alone means choosing to sustain myself. I have become passionate about taking care of myself inside and out; making my own meals out of whole foods and taking the time to relish them is a huge part of self-maintenance. I savor what I’ve made. A woman can’t live on peanut butter sandwiches alone, though they are tasty, especially when they’re toasted. The spirit starves as much as the body does when a person doesn’t eat good food made by someone who cares. Make yourself something good and flourish. 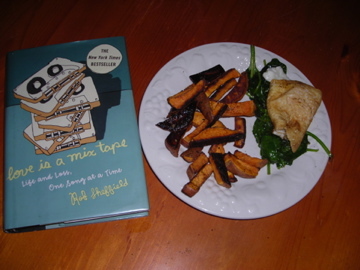 Scrub the sweet potato and cut it into fry-shaped wedges. Coat the wedges with olive oil–enough to make sure they’re covered, but not so much that they’re slippery (perhaps ½ to 1 tbsp olive oil). Season them and roast them at 400 degrees Fahrenheit for 40 minutes, flipping them at 20 minutes to ensure maximum crispiness on all sides of each wedge. About 10 minutes before the fries are done, heat a frying pan on medium-high and add a bit of olive oil (1/2 tbsp) to the pan. When the oil is hot, add the spinach and sauté it quickly, just until it’s bright green. Season it. Put the spinach on a plate and fry the egg in the already-hot pan. Sprinkle the egg with pepper as it cooks. Make sure to take the egg out of the pan when the yolk is still a bit runny, while the white has crispy bits around the edges. Put the egg on the spinach and nestle the sweet potato fries next to the spinach. Marvel at how pretty your meal looks. Taste every bite. Angelle, this is good and true. You have to love yourself and treat yourself well, before you can love anyone. Keep loving youself and I will always keep loving you! This was beautiful! And like any good food writing, it made me salivate. As someone who eats alone frequently (lunch every day, sometimes two to three dinners a week), and someone who dislikes microwave foods AND cereal, this really resonated with me. I love food and I love to make food and one of the best things about eating alone is getting to eat EXACTLY what I want.